Blessed Sacrament Catholic Academy has various options for broadband services as well as access to experienced IT and telecom specialists. We currently have 24 computers, 5 Chrome books, 10 smart boards and 100 iPads connected to the internet throughout the Academy. In addition to the internet connection, the computers are also supported by a number of peripherals, principally printers and scanners. These devices are located in areas where they can best match the needs of that area. For example, the computer lab enjoys the support of one high-speed laser printer and a smart board to support 21 computers that are being used by the students on a daily basis. Microsoft Office 2013 is used across the curriculum for word processing, presentations, spreadsheets, and data management. 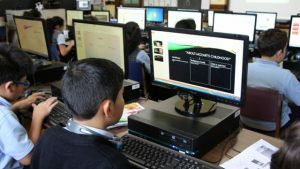 Blessed Sacrament Catholic Academy continues to evaluate educational software and purchases licenses to support the curriculum. Currently the school uses Internet Explorer and Google Chrome for the purpose of internet access. The staff of Blessed Catholic Academy is knowledgeable about technological tools and they value their use in the education process. Our staff has the training to integrate technology into the curriculum. A majority of our staff is highly proficient in the use of word processing and web-based resources. Blessed Sacrament Catholic Academy will keep providing support for staff development in the academy through faculty meetings and other professional development.